I filmed a video for my top Spring 2012 Nail Polish picks, and I had planned to film a separate video for the limited edition make-up pieces, but I figured that would be redundant since I have filmed so many seasonal brand review + tutorial videos recently! I decided, instead, that a post would be more useful shopping guide to help you select which limited edition pieces to invest in. Yes, that means all the products shown in this post are limited editions, so if something strikes your fancy, go get it before it's gone! I'll go through one category at a time, starting with the blushes. 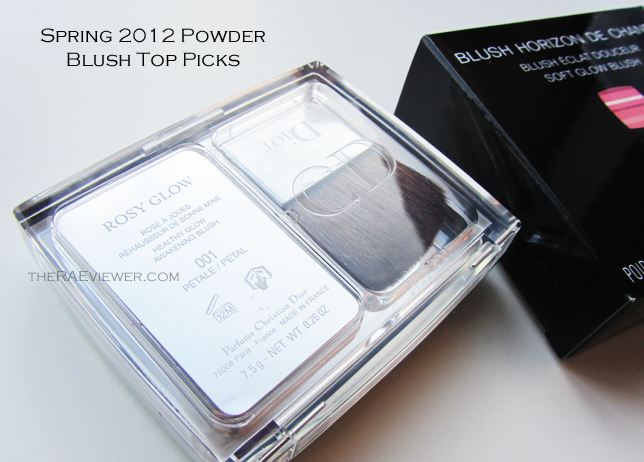 Between the powder blushes this season, Dior Rosy Glow is my favorite. It applies smoothly and evenly across the cheeks and while it oxides according to the moisture levels in your skin, looks beautiful on everyone I've seen it on. Use sparingly. Chanel's Horizon blush is a gorgeous coral-pink in the pan, but it fails to translate to 'exceptional' on my skin. I prefer the Chanel's Joues Contraste or Tweed blushes. All things considered, Dior's Rosy Glow is the winner for powder blush this Spring. Based on concept alone, it is worth keeping. There were several powder, gel, and cream blushes this season, but my overall blush pick this season is Laura Mercier's Innocent Peach Creme Cheek Colour! It's the perfect shade of peachy-pink, so easy to use and apply. Build up slowly in layers, use a synthetic brush if you desire [see it in action HERE]. It lasts throughout the day without getting patchy and the cherry on top? Innocent Peach is very affordable! Now for the eyeshadow quads. I know four palettes are pictured above, but there's a specific reason to feature each one. YSL Ombres 5 Colour in 13 Candy is my sentimental favorite because it is so whimsical yet wearable [see it in action HERE]. The pastel theme is not one that is seen often, but the execution of this palette was flawlessly done. Use a sticky primer like Too Faced Glitter Glue for optimum glitter performance! 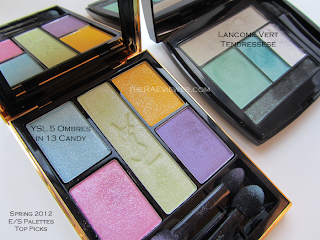 Lancome Color Design Palette in Vert Tendresse is my favorite palette for a bright yet deep smoky eye. Great seasonal transition palette, wonderful to use on nights out for a party or special event. The colors coordinate perfectly [see HERE]. 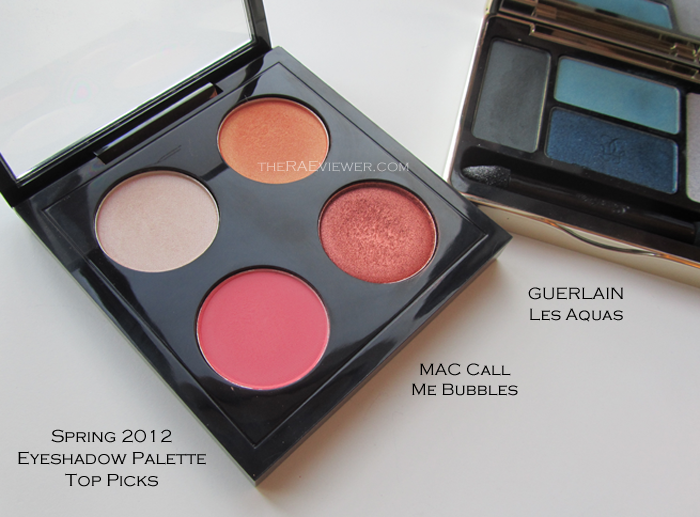 MAC Call Me Bubbles is the most neutral of all the palettes, easiest to use on a daily basis. The shades definitely run warmer, and the combination of the depth in the colors compliments brown eyes well [see it in action HERE]. Guerlain's Les Aquas is one of the most unique blue/green palettes in my arsenal, a combination of cool and warm-toned shadows. Medium to full pigmentation, makes a wonderfully smoky eye look [see it in action HERE]. My favorite lip products this Spring are the YSL Golden Gloss in Golden Peach and Guerlain's Rouge G in Rose Piquant. 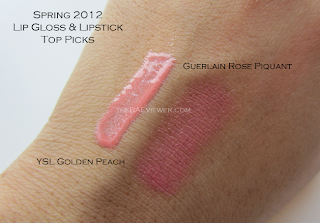 Golden Peach has a slightly watery feel since the formula has been updated, but it is still relatively long-wearing. True to the nature of the Golden Glosses, the shimmers are very multi-faceted and provide a plumped lip illusion. 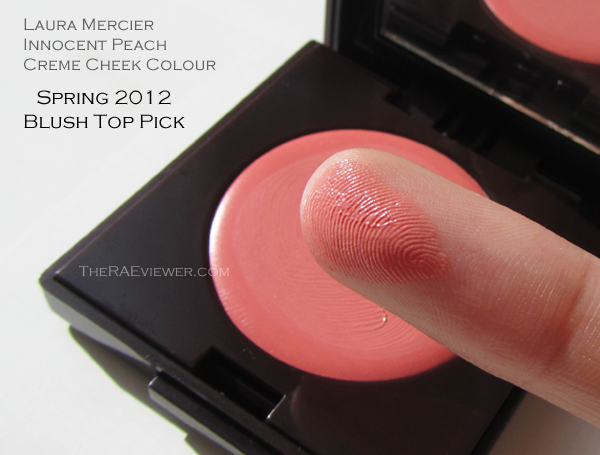 The base is of sheer-medium pigmentation, looks best with a peach lipstick underneath. 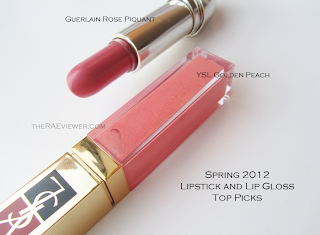 Guerlain's glossy Rose Piquant lipstick is of sheer-medium pigmentation, not super long-lasting, but the formula is very moisturizing and hugs the lips well. Great basic lipstick with a nourishing formula and luxe packaging! Last but not least, for the best highlighter of the season.. Guerlain's Cruel Gardenia. This product was sold out online a while back, so here's the full review with swatches HERE. If you can find it at a counter, I would pounce on it! Bottom Line: This Spring was quite impressive. Treat yourself! Just picked up the Dior Rosy Glow blush! I love it! It's so finely milled. Thanks for your review! I like Dior Rosy glow too. It has become my favorite blush. The color seems to get more intense after you put it on. I want to try the ysl palette! But I feel like I wouldn't be able to pull it off, because of how medium toned my skin is! 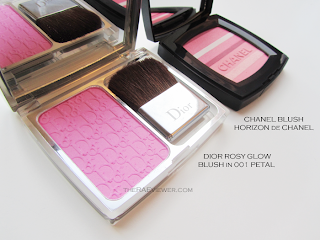 argh, now i want to have the dior blush! I could have sworn that the Dior Rosy Blush was not limited edition but looks like I'll have to make a ran to grab one! I bought the dior rosy blush and I must say I love it you do not need much and it has great staying power better than the chanel ones. Thanks for yet another great review! I loved the Call Me Bubbles palette on you! !